historical town of Tralee, yet close to Dingle and Killarney. Tralee is home to many attractions and facilities including Ireland's National Folk Theatre 'Siamsa Tire', The Aqua Dome, The Rose of Tralee Festival, Kerry County Museum and beautiful Tralee Town Park, to name a few. Proud to be part of the world famous Wild Atlantic Way, with the stunning scenery of The Dingle Peninsula right on the doorstep. Well positioned for sightseeing throughout the Scenic Southwest, Ross Castle, Inch Beach, Killarney National Park, Crag Cave and the Ring of Kerry. 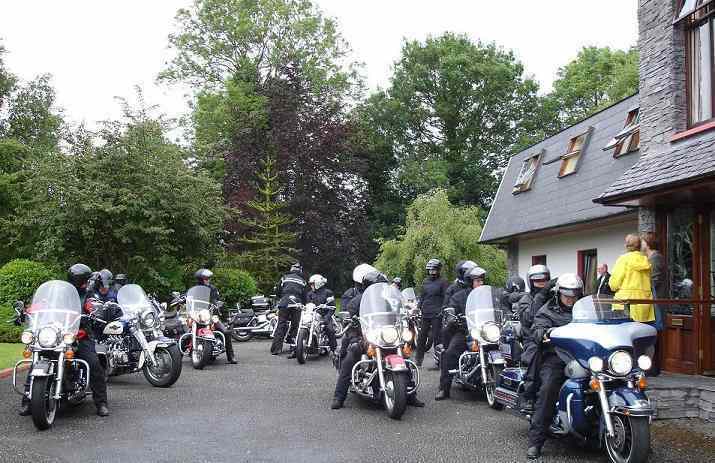 Biker Friendly Accommodation Ireland, County Wexford, Co Down, Cushendall, Dun Laoghaire, East Kenmare, Holywood, Larne, Limavady, Rathdrum, Co. Wicklow, Waterford, Southern Ireland, Northern Ireland, Clough, Martinstown, Cullybackey, Kells and Galgorm, Broughshane, nine Glens of Antrim, Lough Neagh; Port of Larne is close with ferries to Stranrear, World Heritage Site, The Giant’s Causeway, Carrick-a-Rede Rope Bridge, Killarney National Park, Ross Castle, Ring of Kerry, Dingle, International Rally of the Lakes, Bike Fest Killarney, Hotels, B&B, guest houses, cottages, hostels, camping. Ideal for touring! bikers are welcome, vibrant town of Killarney - full of history, heritage, activities, and world class hospitality. Attractions include Ross Castle, Inch Beach, Killarney National Park and touring the Ring of Kerry.